An interesting fact about mayoral candidate Charlie Taylor is that he's made the personal choice to use cycling as his primary form of transportation. Citing the health and environmental benefits, along with the convenience, Taylor's been a cyclist all his life. But he's also got a few changes he'd make to the city's approach to cycling to make it more appealing, if elected mayor. For one thing, Taylor noted that much of the city's cycling infrastructure is operated by the National Capital Commission, and seems suited more for recreation than function--noting in particular the 220 km of recreational paths collectively referred to as the Capital Pathway network. Of particular note, Taylor wanted the 20 km/h speed limit for cycling on the Capital Pathway taken away, "because it’s not feasible for commuting, going at a fast walking speed." In terms of encouraging more citizens to take up cycling, Taylor said that finding a way to make people feel safer while on their bikes is a way to get them cycling. (This statement was backed up by an Ottawa Citizen-commissioned poll published just after our interview, in which more than half of all respondents said they'd bike more if they felt safer.) On top of establishing designated cycle lanes on roadways, and even cycling-only streets, Taylor suggested painting cycling lanes a different colour from roadways would make people feel safer. Designated bicycle lanes, in Europe, they’re a different colour. They’re blue. I’ve biked a lot when cars are taking a corner, and they zip into the bicycle lane because it’s just another white line on the pavement and they don’t really pay attention. 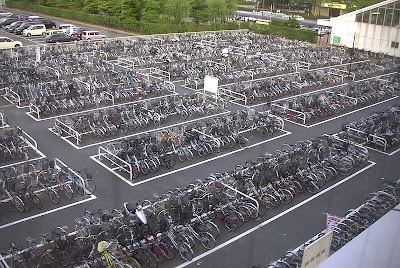 If you’ve got a whole different colour, it’s a lot more visible, and people think, “Oh, that’s where the bicycles are. That’s not for me, I’m a car driver; that’s where the bicycles are.” And how much does blue paint cost? Taylor also said that the city needs to find a way to define cyclists: Not quite motorists, and not quite pedestrians, and sharing some rights and responsibilities with both. "There’s also this myth that bicycles are a motor vehicle, and are treated as such. A bicycle is not a motor vehicle, and they need to be recognized as a distinct form of transportation. I agree that most of the rules of the road should apply to cyclists, like stop signs, stoplights, all that good stuff, absolutely. But there are certain things. If a cyclist wants to make a left-hand turn on Bronson at rush hour, you can’t expect a cyclist to pull into the left-hand lane, sit in traffic with cars going by on both sides, you’d have to have a death wish to feel comfortable doing that." I've done that - left-turn on major streets. It's not a deathwish as long as every follows the rules. So much of this debate is about perceived safety rather than actual safety. So is he planning on prohibiting bicyclists from making left turns? How is that better? He's saying the bicyclists can use the sidewalk and pedestrian crosswalks instead of turning lanes. This is about perceived safety, which is why so many people don't bike to commute. The whole point is to get more bikes on the road, and to do that you need to make people feel safe.